3D Scanning for dimensional measurement is a technology that has been around a relatively short time and like all new technologies it takes time to mature. Plastic-IT Ltd have looked for a system that is truly applicable to the world of injection moulding measurement and are now launching ShapeGrabber onto the UK market. What can a ShapeGrabber scanner do? It can sit on or close to your production line and measure the complete A and B surfaces of an injection moulding in minutes and without further intervention, report compliance with standard or report any deviation – fully automatically. Unlike CMM and control dimension checking, ShapeGrabber compares the total surface of the moulded part with the original CAD – 10’s of millions of data points captured faster than a CMM can capture 10. 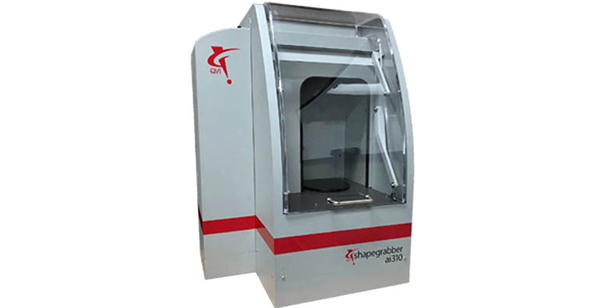 Consequently, using a ShapeGrabber on the production line means the highest level of quality control at very low cost with fully automated reporting. Integrated with a robotised line, for instance, one product can be directed for checking by ShapeGrabber with subsequent production ‘quarantined’ until a few minutes later, a “pass” report releases the measured part and the quarantined products for the next process. Full data reports are logged and can be related to each small batch of parts produced between scans which can be as frequent as 20 time per hour. The application of a scanner such as ShapeGrabber is a real game changer. Now, for very little consumables cost and zero labour cost, a virtually absolute guarantee of quality compliance can be offered by the moulding producer along with automatically produced and logged data of any deviation from standard. For first off sample measurement, scanning is the only method to accurately determine the deviations from the intended CAD. All thermoplastic injection mouldings shrink and warp – it is a fact of the physics of the process. The magnitude of the shrinkage and warpage is directly related to the process. The production objective is to achieve product where the shrinkage and warpage is within the tolerable standard. Because 3D scanning covers the total A and B surfaces of the part a complete record of any offset from the intended CAD can be rapidly visualised and specified detail and control dimensions measured. In comparison, CMM measurement is dreadfully slow and is driven to check predetermined ‘control’ dimensions – that’s all that Co-ordinate Measuring Machines can do – measure (slowly) as many ‘co-ordinates’ as are pre-determined by engineers who have grown up unable to measure the total geometry. 3D scanning takes off these restrictions and facilitates true Product to CAD comparison – quickly and at very low operating costs.